One of the reasons people are slow in adopting or using electric vehicles (EV) is that the charging infrastructure does not come with the vehicle. Typical EV can travel only around 300 km before needing a recharge. Also, the time needed to fully recharge can be as long as 3 hours. Add these things together and you get a hassleful experience of owning a vehicle. What if you don't need to recharge but just swap the drained battery at any of the recharging points? And, on top of that you are given the option to lease rather than purchasing the vehicle. This is exactly what Slovakia's EV pioneer GreenWay is offering to consumers particularly commercial entities. And GreenWay said it has achieved another milestone in terms of number of miles travelled for the past 6 months which is the world's furthest. 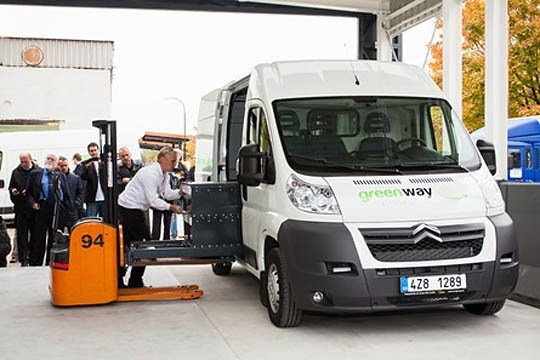 Slovakian commercial electric vehicle pioneer GreenWay claims the two vans it leased to its first customer in May have since travelled further in a six-month period than any other electric vehicles. GreenWay, which supplies fully electric vans for business-to-business (B2B) customers in return for a monthly fee, says the vans it leased to pharmaceuticals and medical supplies company Med-art travelled an average of 38,502 km – the equivalent of a round-the-world trip – in six months. The EV company operates a string of battery replacement stations ensuring drained batteries can be replaced instantly rather than having to be recharged to keep vehicles on the move. GreenWay says Med-art reported the running costs of its EVs were 'significantly lower' than those of its conventional vehicles because of the long distances travelled – one of the reasons GreenWay targets B2B clients with its 40,000 km and 70,000 km packages. Med-art also reported no interruption to vehicle availability during the six-month period, proving the vans' reliability, according to GreenWay. According to GreenWay's website, there are 10 battery changing stations across Slovakia as well as in Budapest, Hungary; Brno, in the Czech Republic; and Vleden, Austria, with a further six Slovakian locations in the pipeline. TheGreenMechanics: If you think that using electric vehicle is not viable yet, leasing maybe a good start. Leasing will hedge you against the risk of inability to make full use of the vehicle due to slow adaptation and lack of infrastructure. Good for commercial use. Question is, who will want to start that venture in Malaysia.